When Amenhotep III (reigned c1390 - 1352 BC) became Pharaoh in 1390 BC, Egypt had become the richest and most powerful nation on earth through war and conquest. The new king tried a different approach - diplomacy. In 1390 BC, Amenhotep III took the throne. He was lucky: predecessors such as Ahmose and Tuthmosis III had battled hard to expand Egypt's borders and there were no more wars to fight. Still, he faced his fair share of challenges. Egypt was wealthy, so it was envied. Countries like Babylonia, Assyria, and Mitani were emerging as potential new rivals. Amenhotep needed to protect Egypt from these rivals, but desperately wanted to avoid yet more war. Another solution was needed. Instead of fighting his enemies, Amenhotep decided to talk to them. He began writing to the other rulers of the Near East, carving letters on small stones that messengers took to foreign princes. 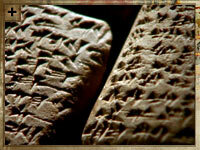 The Amarna letters, as they became known after they were found in 1887, were the key to Amenhotep's success. They show that he was controlling his world, not with weapons, but with words. The pharaoh had become a successful diplomat. Amenhotep had one main advantage when negotiating with his rivals: Egypt's great wealth. Its control of the Nubian gold mines gave Egypt riches that other countries could only dream of. Ambassadors brought gifts of friendship and smaller countries sent endless tributes of exotic animals and other treasures in order to demonstrate their loyalty. The Amarna letters show that even kings were desperate for a share of Egypt's gold, and that they were not too proud to beg. Amenhotep replied cleverly, giving them some gold, but always leaving them wanting more. What the foreign princes wanted most, however, was to marry an Egyptian princess, not just for her dowry, but also to cement relations between two nations. This request was always refused. Amenhotep did not want a foreigner to have any possible claim to his throne in the future. With gold and gifts pouring into Egypt, Amenhotep decided to show off his riches and reinforce his position with a massive building program. 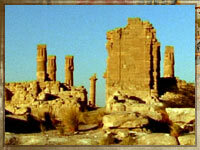 This included two stunning temples built to the south, in Nubia. One was built for Amenhotep; the other was for his chief queen, Tiy. Although tradition dictated that the pharaoh should strengthen the royal blood by marrying into his own family, Amenhotep ignored this and chose to marry Tiy, a commoner. Tiy was a strong woman. Amenhotep saw her as a near-equal, as he showed by building the temples in Nubia. Unusually, these temples were not just built for the pharaoh and his chief queen, they were dedicated to them: in the southern part of his kingdom, Amenhotep and Tiy were worshipped as gods. Amenhotep's new temples were also dedicated to Egypt's many gods, particularly Amen-Re, the king of the gods. 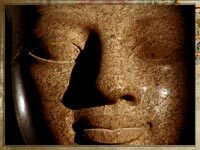 Amenhotep, whose name means 'Amen is satisfied', poured vast amounts of money into Amen-Re's main temple. Over time, the priests at the temple grew richer and ever more powerful. Only they could interpret the will of Amen-Re, which the Pharaoh had to obey. In frustration, Amenhotep switched his interest to another god, the minor Aten, the sun god, a decision that would have huge consequences after his death.